AeroBus is the reputable and specialist of KLIA2 airport shuttle bus in Malaysia. Aerobus aims to provide quality service at affordable bus fares. The two-way trip adult fare to KLIA2 from KL Sentral is only priced at RM14.00. 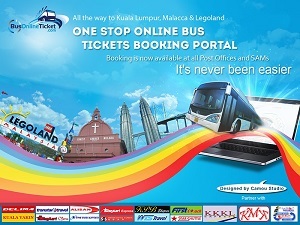 The one-way trip fare to KLIA2 is at RM8.00 for adult and only at RM4.00 for children under 12 years old. In addition to that, Aerobus offers new shuttle services between Klang & KLIA2 and Petaling Jaya & KLIA2 starting from July 2014. There are daily 12 schedules for all 4 newly added airport shuttle services (Klang to KLIA2, KLIA2 to Klang, Petaling Jaya to KLIA2 and KLIA2 to Petaling Jaya shuttle service) to ensure the convenience of passengers going to catch flight.